Red Flag (noun): 1. A sign of danger. 2. The point in time when you notice something is a tad off with the guy you're dating, but decide to let it go because you really like him, you're tired of being single, you really really want to get laid, whatever. Then, when things start going downhill, you look back on that seemingly insignificant moment you dismissed and think: That's when I should have known. Saw something wrong with him -- whether it was suspect grooming habits or ridiculously childish behavior -- but let it slide. It's not that big of a deal. Except it totally was. You wanted to fall in love, but ended up going insane. You swore you'd never do it again. But did. Don't beat yourself up. In the search for love, we've all either blatantly ignored or completely missed red flags. Instead, smarten up. It's time to figure out what you missed and learn how to avoid similar flagtastic fiascos in the future. If you raise your red-flag awareness now, you'll be able to greenlight a real relationship down the road. My Thoughts - Oh to the days where I wish I would have had this book.It all seems like common sense now that I've found the love of my life but I had to kiss some toads. 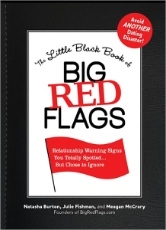 This book shows you what to look for so you aren't wasting your time.The big RED FLAGS that I was so oblivious to before. Single ladies - PICK THIS UP!